yourFXguide-In our last post, we explained the way to find market tops and bottoms with percentage of non commercial long positions. Here in this post, I am going to explain the way to find market tops and market bottoms with percentage of non commercial short positions. Though the applications of percentage of non commercial long and short positions are same, still I explained them in two different posts because they both are alone sufficient to find market tops and bottoms. With the above formula, we can calculate percentage of non commercial short positions for any given week. I imputed 6 years COT report data into a excel spread sheet and calculated percentage of non commercial short positions for every week to present a big picture of percentage of non commercial short positions. See the illustration below. The above presentation explains how percentage of non commercial short positions was changed in last six years. This kind of presentation helps the traders to find the historical highs and lows of percentage of non commercial short positions. Now the question is "How we can find market tops and bottoms with percentage of non commercial short positions?" We should remember increase in percentage of non commercial short positions indicates a bearish sentiment, whereas decrease in percentage of non commercial short positions indicates a bullish trend. At this point, the common question that should be asked is " What happen when the percentage of non commercial short positions reaches an extreme high or low?" The answer of this question will teach us how the market tops and bottoms are found with percentage of non commercial short positions. Let me present some real chart examples. 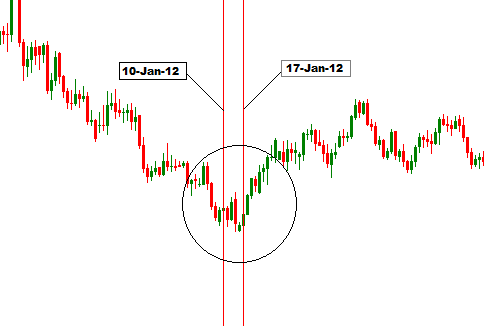 Above illustration is a daily chart of eur/usd currency pair where the pair reached a bottom. That was between 10-Jan-12 and 17-Jan-12. Let me open my excel sheet to find out what happened in that time period. I can see on 10-Jan-12 86% non commercial traders were short on the euro currency, and on 17-Jan-12 87% non commercial traders were short on euro currency. In the aforementioned time period percentage of non commercial short position on euro currency made an extreme high, and eur/usd currency pair made a bottom. 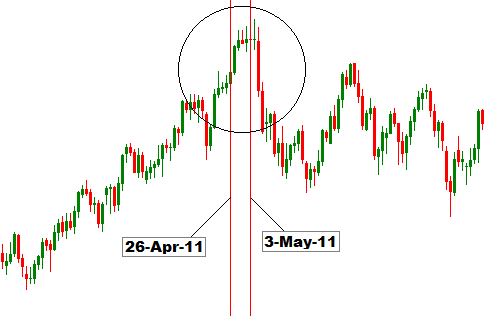 Above illustration is a daily chart of eur/usd currency pair, where we can see between 26-Apr-11 and 3-May-11 eur/usd currency pair made a top. If we look at the percentage of non commercial short positions in that period, we can see the euro currency cot report released on 26-Apr-11 and 3-May-11 shows that on 26-Apr-11 26% non commercial traders were short on euro currency and on 3-May-11 18% non commercial traders were short on euro currency. That were the reasons why eur/usd currency pair made a high in that period. In first situation mentioned above, 86-87% non commercial traders were short, that means a majority number of non commercial traders were short on the euro currency. In that situation very few traders were remain to be short, which indicates over sold condition. 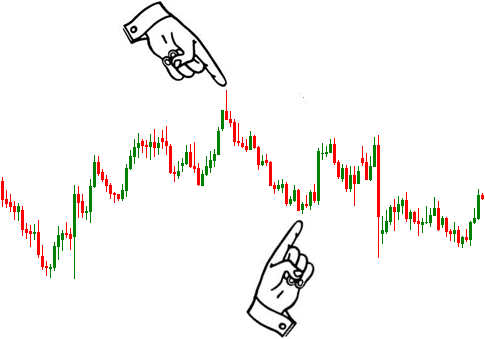 And that is why market made a bottom. In second situation mentioned above, 26-28% non commercial traders were short, that means a few numbers of non commercial traders were short and rest were long. In that situation, a few numbers of traders were remain to be long, which indicates over bought situation. That is why market made a top. So, from the above discussion we come to know that when the percentage of non commercial short position makes an extreme high, market is about to make a bottom. In other way, when the percentage of non commercial short position makes an extreme low, market is about to make a top. Okay, I got it !!! 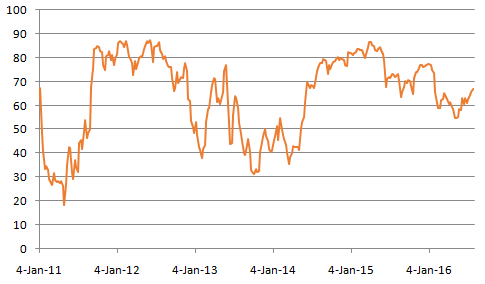 But which are the extreme highs and lows for the percentage of non commercial short positions? And what if the percentage of non commercial short positions remains at a higher or lower level for a certain period of time. I will try to answer these questions in my next posts.